When you have young children, it can be easy to give up on going out to eat at restaurants altogether. Too much hassle. Too much uncertainty. Too much chance of the silent rage from other diners. It’s easier just to get a babysitter. But here at The Out & About Baby Company we say “no sitter, no worries” because there are still plenty of restaurants that roll out the welcome mat for families, and plenty of conscientious parents who enjoy eating out with toddlers, without incident. And it doesn’t mean you always need to choose your local family-dining chain (let’s try to avoid Macca’s if possible). Well, not if you have the right game plan, that is. It requires patience, planning, and a glass or two of pinot noir. Sam Sifton, Food Editor for The New York Times and its former restaurant critic, used to eat out 5 or 6 times a week, and occasionally it was bring-your-kids-to-work day. He says that not only was it possible to take his children to fancier restaurants (i.e. any place that doesn’t serve hot dogs or mac and cheese), but it benefited their appreciation for food. 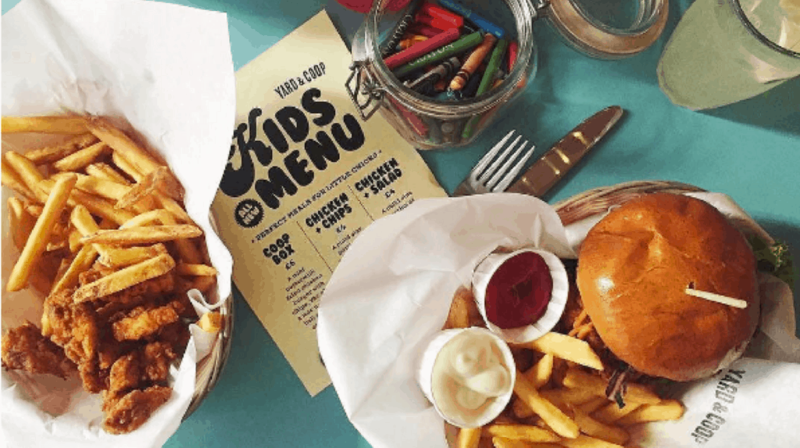 So if you think you are ready to expand your toddler’s resume to include food critic, then check out these top 10 tips for eating out with your toddler and you and your family will be enjoying your favourite restaurant together in no time. First things first, know what you’re getting into. The key to a smooth dinner is parent prep. Decide what your child is ready for, anticipate what could happen (tantrum, poonami), determine how to prevent it and consider what you’ll do if it happens anyway. Just thinking about how you’ll handle these little blips is really half the battle. Look for places with lots of space to walk around. This way, you can take a tour of the place before the meal, and maybe a tour while you’re waiting for the food. Keeping baby engaged and moving around can really help blow off some steam and keep him from getting bored (i.e. cranky). Look for venues with some interesting distractions too—maybe there’s a large painting or an aquarium in the restaurant. A playground across the street or a quiet toy corner? Even better. Definitely stay away from places with dim lights and fine crystal. And try to find somewhere with good, clean baby change rooms to avoid the stress of an emergency “poonami”. Hungry babies are rarely happy, so try to work within your child’s schedule. Make sure you’re not setting yourself up for failure by taking your kid out when they should be napping, or if they are showing signs of fatigue. Nothing will ruin a good time faster than a tired toddler. Sudden explosive diarrhoea is a close second. An 18 month old just can’t go out to dinner at 9pm. The key is to engage, engage, engage—and then you can have your freedom. In other words, if baby keeps busy, you can do more eating and chatting—and less retrieving of the sippy cup from three booths over. Most importantly bring along a special stock of “restaurant-only” toys—novel goodies that baby doesn’t get to play with at home or in the car. Boredom is the biggest trigger of tantrums and bad behaviour. If their needs are met, you can meet yours. And tactile stimulation is best. Go for small, sturdy books and items with bright colours. The real trick, though, is to reserve your ammo. If you have 15 toys and present them all at once, you won’t get very far. Instead, hand them over one at a time, maximising your time and baby’s attention span. Make the most of the tools you’ve got, and you might even make it to dessert. Be sure to clear away any dangerous items from the table and anything that can possibly be thrown. Also, take notice of built-in “toys” (especially if your own stash is skimpy). It’s amazing the power of a few empty plastic cups. Toddlers also have the advantage of being able to make eating a hands-on project. Cut up the food for them. Let them hold it. Let them dip it in the tomato sauce. These are all ways to lengthen their ability to engage. Ask to sit away from any other guests if you can. You won’t feel as bad the if your kids start to fuss. Anytime we go to a restaurant, we are entering into a social contract with everyone else in the restaurant. I’m not trying to ruin your good time, and you’re not trying to ruin mine. It’s important to model that behaviour, so kids can accept the social contract and have a good time. And as in most social situations, confidence is everything. Project how you want your evening to go (a 4-year-old who knows a seafood fork from a salad fork? Impressive!) and be prepared for how it actually might go (an entree that goes cold). You can filter cafes and restaurants on Out & About Baby for locations that have a special kids menu. However don’t always limit yourself to only those places. Kids will eat a lot more than you give them credit for and often if they see mummy or daddy eating it, chances are they will want a bite too. If it’s just not working out? Hey, at least you tried. It can take some serious practice to learn what works best to keep your toddler engaged and happy. It might not go the way you planned this time. Or next time, but you’ll get it. Also, be ready to act fast if things start going downhill quickly. You can always take your screaming child outside or somewhere else in the restaurant such as an unoccupied private dining room. You can also pivot entirely and have your food packaged up in a doggy bag to go. You just have to know when to cut your losses. Like many things in parenting, eating out with toddlers takes practice. If you find a restaurant to frequent, the repeat visits can make for a more relaxing experience. Employees who are especially attentive make all the difference. And about all those squished fries under the table? I always try to tidy up the toddler mess before we go and leave a nice little tip for the waitress. And always remember that chances are, almost everyone in the place has been in your situation at one time or another.